Home Accounting CA Commerce Knowledge e-Filing e-returns Finance ICAI Income Tax Indian Accounting TAN TCS TDS TDS Process, Time & Mode of TDS Payment and Issue of TDS certificate. TDS Process, Time & Mode of TDS Payment and Issue of TDS certificate. A seller (Deductee) provides services to the buyer (Deductor). The buyer deducts the Tax at the time of payment of advances or while accounting the Bills received. The buyer files annual returns electronically to the Income Tax department. The seller files returns, along with Form 16A claiming the credit of the Tax deducted at source. TDS amount shall be paid to the government account through any designated branches of the authorised banks, along with Income Tax Challan No.281. In case of collections made by or on behalf of the Government, the amount shall be cred-ited within the time and in the manner aforesaid without the production of a challan. TDS certificate is a proof that deductor has deducted the tax and paid the same to the govern-ment. This proof is essential to the deductee to claim the credit of tax in his Income Tax returns. *Section 193, 194, 194A, 194B, 194BB, 194C, 194D,194E, 194EE,194F, 194G, 194-I, 194J, 194K, 194LA, 195, 196A, 196B, 196C and 196D shall furnish a certificate of Deduc-tion of tax in Form 16A with in one month from the end of the month during which the credit has been given or the payment has been made, as the case may be. 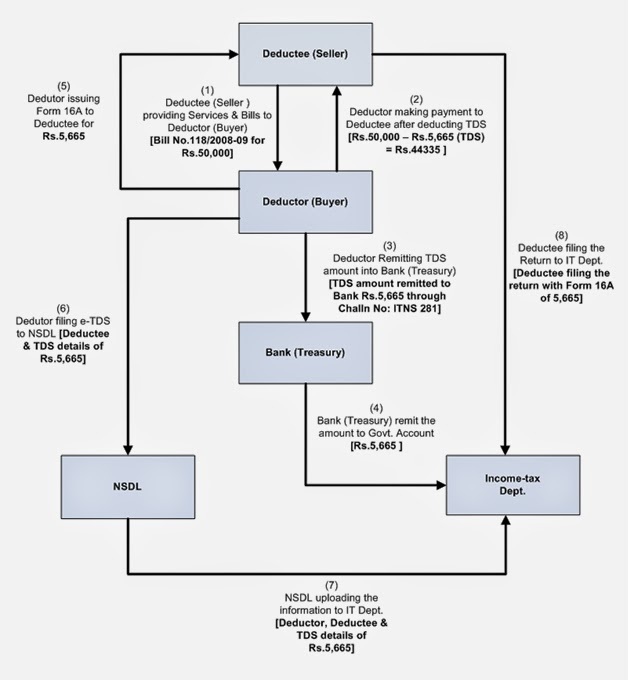 Example: For deductions in May 2009, TDS certificate must be issued on or before 30th June, 2009. In case of deductee to whom more than one TDS certificate was issued for the deduc¬tions made during the year, may on request from such deductee, a consolidated cer¬tificate in Form 16A may be issued within a period of one month from the close of such financial year.